What: It’s a cold rainy day compared to the last few weeks of “winter” here in the CSRA, so what better time to taste and enjoy some whiskey. 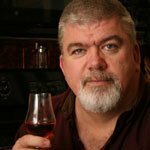 Dan dropped off a sample of Clyde Mays a while back and I told him I would offer my opinion. So I pulled it out and gave it a chance. It was originally marketed as Alabama-style whiskey which means only its origins are in Alabama. The new label on their round bottle honors Clyde and his Alabama roots. Clyde, an Alabama moonshiner, started his whiskey making back in the 40’s and made a name for himself adding dried apples to the mash. This juice isn’t made in Alabama anymore, and Clyde has been dead for a while, but the name lives on as they say. This is a non-chill filtered straight bourbon whiskey. The nose is smooth with coffee cake and caramel corn and a bit of wood. The wood notes are subtle and pleasing as if someone was paying attention to the process. The alcohol doesn’t seem to hit you hard, and it also offers a soft note of wheat, which given all of these things would lead someone to believe it’s a smooth whiskey. Time will tell. The Color is a rich caramel/mahogany that is clear without any cloudiness, which means it has been chill filtered or at least filtered. The first taste was neat and only after sitting in the glass for a minute or two. It was warm without a burn and has a soft mouth feel with a soft sweetness to start and bit of a dry finish. I tried it with a few drops of water to see if it would open up. The second taste came across a bit different once it opened u, and it revealed a bit more wood and some more pronounced flavors like spun sugar, caramel corn with a longer finish that wasn’t as dry as the neat version – a pleasant whiskey to be sure. All in all this is good juice for the money, a great value. Isn’t that what we are all looking for, value in how we spend our money? Sure you could spend 3 times as much for a premium whiskey that you would recognize, but I don’t think you would be any happier in the bang-for-your-buck as you will with this whiskey. 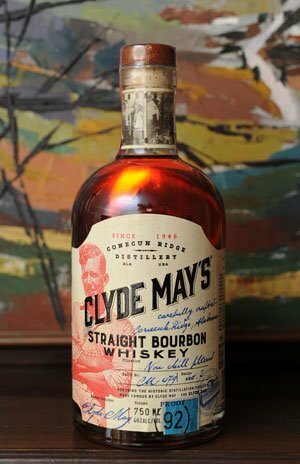 Clyde was on the right track years ago and made a good whiskey with enough character to drink neat or use in your favorite cocktail. I think it would make a great Manhattan as well as sipping on the deck with a mild cigar. 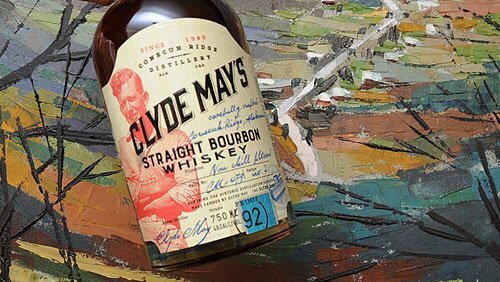 Editor’s Notes: Clyde May’s Whiskey has four distinct product lines – 85-proof Whiskey, 110-proof Special Reserve, 92-proof Bourbon and 117-proof Cask Strength (only 3,000 bottles were produced). Clyde May’s is owned by Conecuh Ridge Distillers, LLC, and was named the Official State Spirit of Alabama in 2004. In the Fall of 2016 they started to expand their market to the entire US. The Straight Bourbon scored 93 points at the 2016 Ultimate Spirits Challenge. Although Conecuh Ridge Distillery is listed as being in Alabama, this bourbon is distilled in Kentucky.